A deluge of books on Islamic fundamentalism had swamped the world's bookshelves following the wake of the 9/11 attacks. Some 100 books and 5,600 articles were written on the subject, many focussing on the lives of Afghan women under Taliban rule. 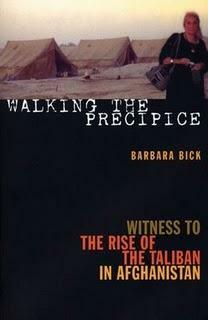 I chose to review Barbara Bick's Walking the Precipice: Witness to the Rise of the Taliban in Afghanistan despite knowing well that another book on Afghanistan and its peripheral issues would fill me with some apprehension. Would it be yet another sob story about those poor burqa-clad women and how much they need to unveil their faces, I wondered? Once in Kabul, Bick, together with a small group of American women made their rounds in orphanages, schools, international health agencies, and support organisations for women widowed by the war. Not surprisingly, the burqa would immediately come to her attention – both a symbolic and physical form of repression she feels impassioned to lift. In 2001, Bick returned to Afghanistan, this time to an even more dangerous terrain: a region dominated by the Northern Alliance, the anti-Taliban militia. Her journal entries at this stage become a gripping countdown of events preceding the 9/11 attacks, including the assassination of the Northern Alliance's leader, Ahmad Shah Massoud, by suspected Al-Qaeda terrorists. In the final section of the book, she witnesses during her return in 2003 the drafting of the Declaration of the Essential Rights of Afghan women and the post-9/11 reconstruction, marking a poignant cadence to her adventures in Afghanistan. Bick and her cohorts, all foreign-based, are the dominant figures in this story. With little evidence of Afghan female agency throughout the book, Bick and Co. appear to do much of the "rescuing", reinforcing the idea that feminism is a privileged woman's preoccupation. The one major weakness in Walking the Precipice is the second-hand interpretation of events due to her inability to speak any of the local languages. She appears to be a sympathetic observer at best, but a helpless bystander of the injustice around her at worst. Just as interesting is Bick's experience with the different strands of activists fighting for the Afghan women's cause. On her first trip, she travelled with a feminist with a strident pro-Soviet political agenda, while on her second she was in the company of an anti-communist member of the Kabul elite. These are all examples of how groups that are ideologically each other's polar opposites can come to agreement, for better or worse, on providing international aid to Afghan women and children. All in all, Bick's slim memoir, although fascinating, recounts in the manner of adventurous Western holiday-makers and gap-year students in faraway, dangerous places. It is vivid, as many good travelogues are but it is hardly groundbreaking in the sea of post-9/11 books.